[Second version:] Then I am in a small room. On the wall hangs a painting by the painter whom I had met and under it is a legend: “Anathema and death to Artist P., because he failed to honor the fiery child who comes out of the water, and that is why he will smash his palette.” Now I know what I had promised to look for. "The problem of the coniunctio must be kept for the future, it is more than I can cope with…“ [AaA, p. 101]. Remember further that MLvF said several times to me that she is not allowed to go further than Jung -- but that I have to do so. See Marie-Louise von Franz' Legacy. This is the actual reason why I go now on with my interpretation. I regard this as my duty that I have to fulfil. As we have already seen, the red or fiery child is the red tincture or the (red) quintessence, the very last goal of the opus. Further we have seen that Jung as well as MLvF concentrated on the blue quintessence. MLvF even says that the red tincture is a relatively irrelevant by-product of the opus (if I remember correctly). Thus, both looked for the spirital aspect of the opus, but not for the material/corporal. Though most Jungians would deny this statement and say that with synchronicity Jung had included matter, I have shown in several posts (and in my mss) that synchronicity includes a spiritual or an incarnation in the mind, but not a material incarnation. The description of the latter seems to be my continuation of Jung's and MLvF's work. Here the red child is situated in the earth (the brown top of a mountain). It is the pupilla that I interpreted as the symbol of the physician (Telesphorus/Asklepius). Red, the rubedo is the last stage of the alchemical opus; the other three colors belong to the nigredo, the albedo and the citrinitas, the first three stages. Thus, the eye in the earth symbolizes the alchemical opus. Since it is situated in the earth, it has to do with matter and with the body. This is why it was my fate to discover Body-Centered Imagination. 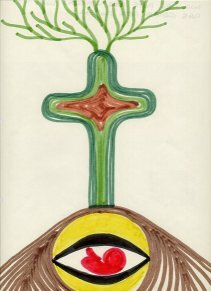 In it the vegetative body, the cross-tree in the image, begins anew to flower. This is the result of the twin process, in which bodily matter and/or the matter of the universe is revitalized. It is the individual and the collective healing process that Paracelsus -- born exactly 450 years before me -- called the vita longa; the creation of the subtle body for a long and healthy life in this world and for a conscious life in the afterlife in the otherworld. There are 2 x 3 branches of the cross tree. During that time I surely did not know anything about my later discovery of the twin process, in which the 'one three', i.e., physical and/or objective psychic energy is transformed into the magic matter-psyche, the energy of the unus mundus and the otherworld, and re-transformated into physical and/or objective psychic energy with higher order; the healing process, be it individual, be it collective. Only later I dreamt that I was honored with the Nobel Award exactly since I had discovered the 2 x 3, ie the bipolarity of the energy term (including matter-psyche). Last edited by Remo Roth on Sun Dec 18, 2011 12:03 pm, edited 1 time in total. I see how a number divides by six. The result is 1 1 1 0 1 1 1. For this realization I receive the Nobel Award in physics and mathematics. Last edited by Remo Roth on Sun Dec 18, 2011 12:03 pm, edited 2 times in total. 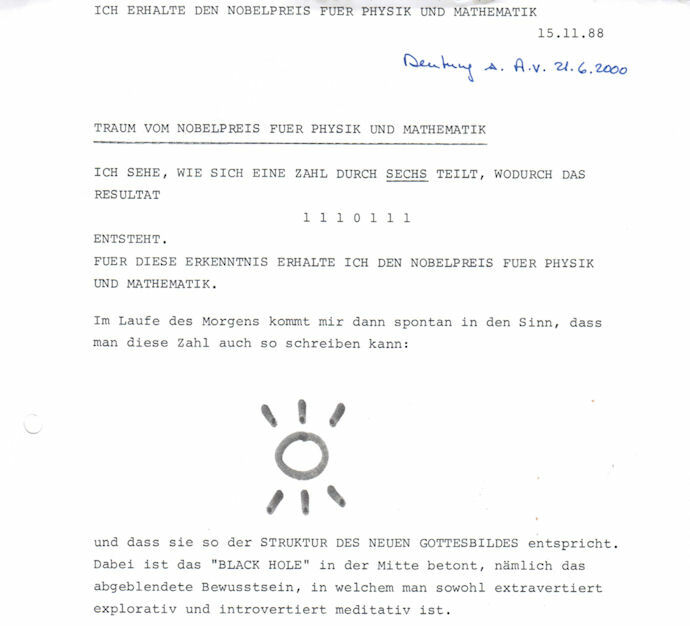 Here is the page from the manuscript. 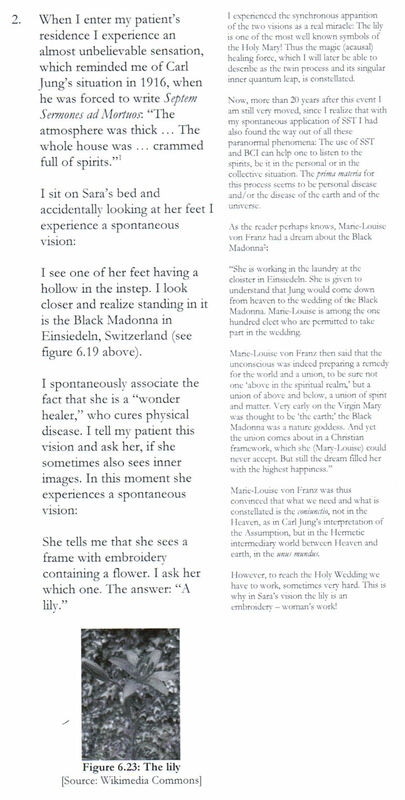 I also quote MLvF's dream of the wedding of the Black Maria in Einsiedeln. Thus, also this dream belongs to all this. Last edited by Remo Roth on Sun Dec 18, 2011 1:48 pm, edited 1 time in total. Last edited by Gone on Sun Apr 10, 2011 4:06 pm, edited 1 time in total. I would like to chip in an inquiry: it seems to me like in these last posts you side more with the 'red' and make the 'blue' appear more 'negative', and even as a source of 'evil', i.e. 'dis-ease'. Maybe I haven't read your posts carefully enough, but how does Pauli's 'chtonic blue' fit into this 'blue vs. red clash'. It seems to me that 'blue alien' yearns to 'return home' (i.e. into the 'center of the earth'). Ealier, I have been musing about a 'blue v.s. blue clash' with respect to this thread. And very 'clash situation' calls for a coincidentia oppositorum. I would be grateful for some elucidations. P.S. : I have this spontaneous image of a 'blue alien' reaching the red child in the center of that pupilla now. Something about an 'exchange of attributes' between the two. I had this dream: I was in a cabin in the woods, sitting on a bed. There were people inside but also outside the hut. Jung arrives. He came to see me. Jung was an open book in one hand. He is tall (as in real life).He does not seem to like me. He told me that I discovered two things about him. The first: that's something few people know, he talks about it a long time, and I do not remember anything. I see through the window a vagabond happen. He has a gun. He kills everyone. Only Jung manage to escape. comment : this morning, I dream of the red book. I think we cannot generally say that blue = spirit and red = matter/body. In Pauli's dream Jung amplifies with the blue coat of the Virigin Maria; Pauli, however, amplifies with the (magic, i.e. acausal) blue flower of German romanticism and with the corn flower of Demeter. Thus, his blue has much more to do with acausality (and Jung's amplification with causality). Symbols are ambiguous, and what they mean one can only find out in the context. I tried this with the above interpretation of Jung's 'causal blue' versus Pauli's 'acausal blue'. it seems to me like in these last posts you side more with the 'red' and make the 'blue' appear more 'negative', and even as a source of 'evil', i.e. 'dis-ease'. To me it seems that in MLvF's case the blue became in fact destructive. She told not only me but also other people that she had once asked a medium about her old age. The answer was very negative. Then, she suffered this horrible disease. On the other side, the disease was perhaps necessary to her to learn BCI. As I mentioned in other threads, she did this and showed this tendency by calling my book Hat AIDS einen Sinn a real revolution. But when one suffers the disease first one does not see any meaning; one only realizes the horror. For MLvF it was such an intense horror that she thought that she starves herself to death. Couldn't 'blue sand' mean the acausal behavior of matter? Thus, exactly what Pauli amplified? The magic acausal force in matter (blue flower and Demeter)? In Dec 2010 or Jan 2011 I became conscious of a fact that I did not really know before. In the Renaissance the Platonic and Neoplatonic world soul (controlling matter from a heavenly sphere, the Empyreum) was replaced by the Pneuma of the Stoa. The latter does not need the so-called 'first mover', i.e. God. It is a force in matter itself (this is why Pauli calls it also 'materialistic'). It is what I call the ability of self-fertility of the world soul. One can also show that at the end of the 16th century and the beginning of the 17th acausal magic and causal physics lived in co-existence. Then, mathematics entered the description of matter (Galilei; Kepler; Newton) and the magical aspect (the Pneuma) was repressed. Then it came back in the discovery of radioactivity -- and in the Pauli effect. IMO, most contents of the Red Book are deeply Hermetic; but Shamdasani distorts it into some Neoplatonic stuff. This is why I prefer Stephan Hoeller's Gnostic/Hermetic interpretation of the Seven Sermons to the Dead, a very important part of the Red Book. Above I was reminded of them respectively of the return of the spirits in Jung's case in 1916. By writing the Seven Sermons he tamed the spirits. PS: But then, in 1928, he returned to Neoplatonic philosophy when he interpreted the Daoist Golden Flower and especially the anima mundi in it as the Anima. Expressed in my terminology he then reduced what I call matter-psyche, the magic Pneuma energy, to feminine spirit-psyche, i.e., symbolic thinking. And I think more and more that MLvF became sick because of a similar reduction. I do not know. But if I found something, it must be something simple. I am not a scientist. so you can hear 'bleu' twice in French: sable bleu -> sa bleu bleu, quite emphatic on the 'bleu' then. Last edited by Gone on Tue Apr 26, 2011 10:26 pm, edited 1 time in total. Last edited by Gone on Tue Apr 26, 2011 10:25 pm, edited 1 time in total. But there was one hope in this dream, at least in the association. I spontaneously associated one of the dreams of the resurrection of C.G. Jung. It seems that I have never posted this one. ...I've tried for some time to understand this feeling. I fall for hours with the dead, the ghosts I try to understand"
Remo's Black Hole and Fox' Blue Sand, "Sable bleu", strongly echo to me. about what happened on Nov 26, 2009, as I was thinking a lot of number 1480, value of Greek words Christos and Telesphoros. I went to see a new traffic circle which was designed by my son-in-law. I climbed on a sandstone cliff to take a picture for him, and then made a walk in the mountain above. I found a path that led me to an asphalt road I had never been before, and the first house I met had a big 1480 on its mailbox, and there lived some JUNG ladies (pics on my blog). I had absolutely no idea about the meaning of 'die Salbe'. It means 'cream' in German, and the verb salben means 'to anoint'. I knew the Greek Χριστός - Christos (= 1480) means 'anointed', and I checked it's in German der Gesalbte, coming from salben. inspired from a post by Remo about 'whole' and 'hole'. I had much to add but felt the UM was poorly interested. HOL means 'profane' and 'sand' in Hebrew. German Salbe made me think of French Sable, 'sand', which is too the heraldry tincture black, 'de sable', while white is 'd'argent'. The immediate Hebrew words for 'sable' and 'argent' are HOL and KSP, while atbash transforms HOL into SPK. This made me use the pattern of the circle looking like a Yin-Yang symbol to show this. I added a SoS which fits naturally with the pattern. A few days after that, on Jan 2, 2010, I dreamt I saw two screens. On one there was SOURCE, on the other JESUS-CHRIST. The letters were dancing up'n down, 'til O went on the top of the left screen, making me understand that this letter did not belong to jESUS ChRiSt. I was disturbed by that dream, as I don't dig much Jesus, and until now I only shared it with close friends. I'm not sure about it, but maybe the O apart became blue, as is quintessential O in Rimbaud's sonnet which is very important to me. Soon after that, I happened to found on a page 'the SOURCE of CURSE', about an OT episode where 12 Tribes of Israel are divided into 6 and 6 to give curses and blessings. The 1110111 associated in Remo's dream with divisibility by 6 looks like a binary number, which would be decimal 119. Binary 111 is decimal 7, ASCII 119 (hexadecimal 77) is 'w'. In base 7, there is an easy way to check the divisibility by 6 : the sum of digits is a multiple of 6 (as n-1 in any base n). She bear may be a reference to Rabbi Dov Ber of Mezeritch, founder of Hasidic Judaism, who as I recall Jung saw as a peer - Hasidim is transforming Israel in very recent days and part of NY. Jung was given "bear" (wisdom animal) totem sign by Mountain Lake, the Pueblo Indian, who he met when in the American southwest desert. This second video, while somewhat poorer for quality, does appear to show the exact same event in the exact same time frame. In fact, there have been several videos posted to You Tube that show these two videos side-by-side in a split screen that demonstrates that they are both of the same event. Impressive? Of course. There are apparently multiple witnesses to the same sighting, each presenting video evidence of what was seen. This kind of report makes life difficult for the industrial heckler and career skeptiod. I mean, it's easy to deny a single video or report. But, when you have multiple witnesses AND multiple videos of the exact same event? It's no longer as simple to dismiss. Only the third is a fake to let us believe that the first two are also faked. Hi Remo, This is interesting. For the last two hours, I have been drinking coffee and eating reheated food from yesterday while checking out the forum. I went to the Japan UFO material... but quickly wound up seeing a lot of new info about the Jerusalem UFO incident. Considering that before coming to this forum in 2006-2008, I had spent over 15 years concerned about the Dome-Temple dispute which included a published article and mention in a book about my research... UFOs reportedly over that specific locale definitely get my attention! I also tried to read your 2nd BCI related to Chernobyl, but the link you gave did not work. I was going to post about that and ask you to supply a valid link or say if the post can no longer be read if maybe if it was on Michael's old Blog that is no longer available. Anyhow, somehow you wound up in my middle of the night vision activities last night, along with a psychiatrist who was my boyfriend right before I met my husband. We were waiting with a lot of other souls for what the One and Only said the other day is the "evacuation" - as I have already mentioned to fox and Jan over on another thread - not by UFOs and other material means - but something to do with the astral realm being transferred to a higher dimension so that souls would not be recycled back to the earth plane. For some reason, it had never occurred to me until this morning when I was re-reading and re-considering the recent (and former posts) about the Beyond having become contaminated by radioactivity... such as fox's reports from his deceased grandfather... that not only is our planet being destroyed but our usual after life home as well... so, where do we and they go? Hmm, looks like I have to go now and do really mundane things like wash the dishes and get garbage bagged up. This below is your Chernobyl BCI link that did not work. I altered the link content a bit , but it still did not work. "The topic or post you requested does not exist"
This is again the link. In my PC it works. Nope, it still does not work for me. Maybe it is held in your cache and can be viewed by you. Anyhow, I went back about an hour ago in my old E-mail to Feb. 14, 2008 to find the link you provided then to your reflections on Chernobyl and a connection to a certain "my guy"-related locale. Here are two posts I made to fox about my current vision related to that locale. Fox's bringing up the topic of damage to the Beyond by radioactivity by way of a message from his deceased grandfather tends to go to show that these issues are not just yours, Gregory's, Ann's, or mine. P.S. The One and Only does not use projected willful magic. His methodology is based on the Hermetic principle of sympathetic vibration. It is an aide in establishing a communal mind/soul meld in eros/logos love beingness rather than a force field manipulation. Duh, I can probably come up with a simpler term than that at some point. Signing off my computer now for a few hours. Nope, it still does not work for me. Must be some trouble in your PC. When I reload the UM forum (and thus empty the cache) I can also reach the link. I would like to hear from you what you think about this. As much as I remember, you sometimes intervene actively. Am I wrong? 'Methodology' well this is too Logos for me. But I'd rather not discuss these things publicly. Marie-Louise von Franz : [...] [i]Thus I became interested in symbolism in arts and I even started to paint, but I had little talent: not sufficient to accomplish much. I began to see that which it was and I was depressed. It seems the stage is being set for a destructive Hostile Brothers coniunctio. The theme of the Hostile Brothers was touched on in Dome of the Rock. New evidence has emerged that the Iranian government sees the current unrest in the Middle East as a signal that the Mahdi --or Islamic messiah--is about to appear. In Sunni and Shia eschatology, the Mahdi (English: Guided One), also Mehdi (English: One of the Moon) is the prophesied redeemer of Islam who will stay on Earth for seven, nine or nineteen years (according to various interpretations) before the Day of Judgment (yawm al-qiyamah / literally, the Day of Resurrection)and, alongside Jesus, will rid the world of wrongdoing, injustice and tyranny. In Shia Islam, the belief in the Mahdi is a "powerful and central religious idea" and closely related to the Twelfth Imam, Muhammad al-Mahdi, whose return from occultation is deemed analogous with the coming of the Mahdi. When I painted it, I called it the 'deer man'. I interpreted it in my thesis as Kerunnus, as we know him from the vessel of Gundestrup. Of course, I did not know anything about Northern mythology since I had been a stupid systems engineer and programmer. He is a vegetation and death god who can communicate with the beyond. Thus, he is a similar symbol as is Anubis in my imaginations. 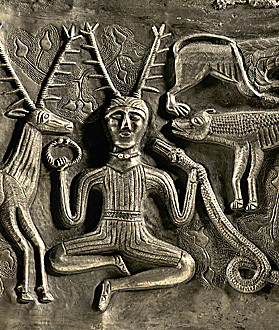 Also Merlin is connected to the deer, and Mercury, too. Since all these gods have also hermaphroditic aspects, today, I interpret these gods as the world soul, the Eros Self. They all are also gods that know and use divination. Last edited by Remo Roth on Sun Dec 18, 2011 12:04 pm, edited 1 time in total. The other aspect of Marie-Louise's image is this disc, it seems at the place of the manipura chakra. It is the chakra of aggression, and in my interpretation out of it, by a transformation of the energy, the Logos creativity is born. I am together with my brother and my father. Albert Einstein joins us, and we are informed that he is the father of our father, thus my grandfather. I see him very clearly before me, and he is dressed in an old-fashioned frock-coat (as Sigmund Freud in the well-known pictures of him). Einstein shows me a relatively big silvery disc (more a 'Plakette'; plaque? I was reminded of the Einstein plaque, the 'Nobel Award' vor mathematicians)) on his upper belly, in the region of the solar plexus (and manipura chakra). He says that he always wears this disc since it protects him from violations from other people. After two hours Einstein will be honored. Oddly enough, this happens in a Christian service (mass?). We all, my father, my brother and I would like to attend the service. Before, however, we have to take a bath. First my father, then my brother, and then I. Yet in the dream I know that this bath has to do with what I called then 'dimming out'. Today, I call this the transformation of the Logos ego into the Eros ego that in fact has to do with a concentration on the solar plexus/manipura. soon. The dream brought her great joy." After this dream she decided to study ancient classical languages, because the gods wanted something from her. Zeus, his wife Hera, Hermes and Aphrodite. soon. The dream brought her great joy[/i]." I also dreamt several times that she was healed. These dreams made me very sad since I realized that in reality it was not true. However, when I shared the dreams with her, she always felt very happy. Today I ask myself if such a severe disease helps to create the subtle body for the life in the beyond. I have experienced this in a very impressive way in the case of a patient who suffered a mamma carcinoma. It was almost incredible how her vegetative body developed. This was shown by her experiences, images of BCI, and synchronicities. In the last months she was the 'therapist' for the nurses, etc. that should have taken care for her. She changed the whole situation with her 'radiation'. It was the first time that I realized that this is the real radiation -- and what crime the artificial liberation of the radioactive radiation is. As I write in my Valedictory Address (Personal Memories), also Marie-Louise received this incredible 'radiation'. v.Fr. : I'm not a missionary of Jungian psychology. So when I saw he left it, I thought, well that's that. I began to get bored and thought: he can discuss his matters with Delbrück and other biologists. I got bored and felt my time was too precious. H.S. : That sounds a little bit cynical to me? Is that right? v.Fr. : Yes. One could call it that way. At that time I was naturally sad. Looking back I think I wasted my time. v.Fr. : Pauli was afraid of Jung. He avoided him. He could have analysed with Jung. Jung would have done it. But he didn't want it. It was also a little trick. Not too hot. Not in the hot seat. The anima figure, the Chinese Sophia figure. He took her seriously. That was a compensatory figure for him who tried to impress on him the feminine. But even then he did not take enough notice of her. For instance I published in Number and Time the dream where the Chinese woman says that not the six-pointed star, but the square dance is a real symbol of the Self. He never worked on that further. He didn't pick up those suggestions or work on them as Jung trained us to do. If I had had such a dream, I would have followed up that idea right through for weeks and weeks. In the dream it is said that the six-pointed star is a transitory symbol, it is not the end result. Also in other dreams of Pauli's the six-pointed star leads to the quaternity, as he mentions in a letter to Emma Jung. In my interpretation these squares are what I call "new space-times" after the quantum leaps happening as a result of the observation in BCI. In every inner quantum leap a higher order is reached, symbolically presented as a "new space-time". The three rhythms seem to point to the three energies: physical/chemical energy (outer spirit-psyche), objective psychic energy (inner spirit-psyche) -- and matter-psyche, the magical energy of the unus mundus. This way one can describe the development of the archetypes of Jung's depth psychology as a causal development, as he did in Aioon, synchronicity as a 'twin process' in which in the inner and in the outer process magic matter-psyche is produced, which re-transforms into inner spirit-psyche with higher order (new cognition). However, one can also describe the 'magical incarnations of the world soul into the world of matter': in it physical/chemical energy/matter (outer spirit-psyche) transforms into magical matter-psyche and re-transforms into outer spirit-psyche of higher order. The latter does not obey to known physical laws. It obeys to what Pauli asked for: a third type of natural laws. I think that MLvF was not able to understand this part of Pauli's dream, since she and Jung did not realize what I call matter-psyche. As does physics, also Jung believed in the law of conservation of energy, and thus was not able to define the energy of the unus mundus, magic matter-psyche. Today, I know that I was in the same archetypal conflict with her as Pauli was: The six-pointed star, the Seal of Solomon is as important as is the quaternity. In my view it is what I call the Eros Self, the shadow of the Logos Self. Both together create the coniunctio, the Holy Wedding. Last edited by Remo Roth on Sat Apr 02, 2011 3:57 pm, edited 1 time in total. Further, I can understand all this on the background of what she told me several times (see Marie-Louise's Legacy): She was not allowed to go further than Jung -- but it was and still is my task. thank you for these details, Remo.